In this tutorial we will learn how to configure Qt to use OpenCV. Although the tutorial is targeted for OSX users, you can modify my suggestions for use in Linux and Windows. I assume you have a working knowledge of Qt and you have at least built a “hello world” application using it. Of the few different ways of configuring Qt for OpenCV, we will use the one that involves pkg-config. I have created a simple Qt application that uses OpenCV to capture frames from a webcam and display them using QGraphicsView. A screenshot is shown below. For this tutorial I am assuming you have installed OpenCV 2 or OpenCV 3. If you have not, you can install them using Homebrew. The basic installation commands are shown below. You can find detailed instructions for installing OpenCV using Homebrew by clicking here. Using OpenCV 3 in a Qt application is a bit tricky for OSX because opencv and opencv3 packages contain the same libraries and so opencv3 is not deployed to /usr/local/lib like other packages. I will help you navigate through these complexities. You can download Qt Creator and follow the onscreen instructions for installing it. There are some restrictions on using Qt in a commercial application and you should make sure you know about licensing issues. You may find this discussion helpful. The very first thing to do is instruct Qt where to find pkg-config. The default location for pkg-config is /usr/local/bin. We need to add /usr/local/bin to PATH. Go to Project, expand Build Environment and add /usr/local/bin to PATH. Don’t forget to add a colon (:) before appending /usr/local/bin! See the screenshot below. You may not need the above step for OpenCV 2.4.x. Now that the paths are correctly set up, we need to add a few lines to our project file (.pro) to tell qmake to use pkg-config for OpenCV. When both opencv and opencv3 packages are installed, and you are using opencv3 in your Qt application, adding /usr/local/lib to your path ( as shown in the previous section ) can lead to linking errors. The best thing to do in such a case is unlink opencv. I have spent an embarrassing amount of time debugging the above problem in El Capitan. It does not show up on Yosemite. You may receive a runtime error on El Capitan. Note the actual error message may vary sometimes. The program has unexpectedly finished. To fix it go to Project -> Run -> Run Environment -> Unset DYLD_LIBRARY_PATH. See image below. That’s all you need to know to build a Qt application with OpenCV, but let me throw in another goodie. The following piece of code converts OpenCV Mat to QImage. This will come in handy when you build your first Qt based OpenCV application. # Create an OpenCV image. If you liked this article and would like to download code, please subscribe to our newsletter. You will also receive a free Computer Vision Resource guide. In our newsletter we share OpenCV tutorials and examples written in C++/Python, and Computer Vision and Machine Learning algorithms and news. I have encountered this problem : “dyld: Symbol not found: __cg_jpeg_resync_to_restart”, and solved this problem by the method above. But when I running it in debugging mode, it receive the same runtime error. How can I solve this problem? Thank you for your selfless help! Did you solve the problem when running in debugging mode? cv:waitkey(5000); To my mainwindow.cpp when I push build button I get many errors what should I do? Thank you for this post. It saved me a lot of time. In my case, the paths were different. Maybe because i’m using MacPorts instead of homebrew. Thanks. Yes in case of MacPorts the path will be different. Thanks for pointing it out. I have problems when i want to debug my application. When debugging, the dynamic libs can’t be load. Can this be because the DYLD_LIBRARY_PATH is unset? Thanks a bunch. I am sure someone will greatly benefit from this comment. Hi I have installed the opencv3 using homebrew and qt5.8 in a macOS Sierra. 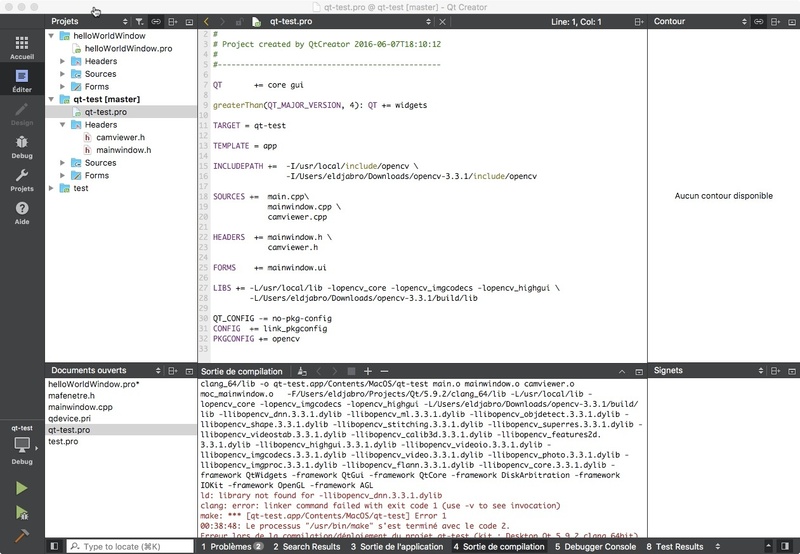 Its very strange cause when I try to use the wich command to find pkg-config I have no answer …, so I try to use the path that you suggest in the video but if I try to build the project I found the error “opencv development package not found”. The process “/Users/charlie/Qt5.8.0/5.8/clang_64/bin/qmake” exited with code 3. I find the error, I just forget a / in the build environment!! Yay! Thanks for letting us know. I am sure someone in future will save a lot of time because of this thread. I already subscribe for the OpenCV books and this script and do note have any answers..
Hi, I’m trying to follow this post with the example code downloaded and the camviewer widget is not showing under the central widget. Any explanation for this? Thanks. Sorry for the late reply. I can’t think of an explanation. I hope you were able to solve it. May be its not needed now. Then you are all good. It depends on your installation. Thanks. When you subscribe, we send send you access to all code in this blog including this post. HI, first, thank you for all the tutorials and thx for helping me understanding the basic and advance notions of computer vision. I have scoured the internet trying to find a solution for this problem, as well as uninstalling and reinstalling opencv to no avail. I’m on a Mac running OSX 10.13.1. Any advice you have would be so helpful! Hi, thanks for your help . I tried to add Dlib to Qt to your opencv explanation above couldn’t succeed ! Can you show us a direction to use both opencv and Dlib with QT creator ? It will be very helpful..
How convert my image data set in csv format ?